Third post in a series from our staff-led Institute Day. In his presentation, Justin Penio explained current practices and policies of EGHS and provided teachers with tools to build relationships, manage classrooms, and respond to behavior issues. 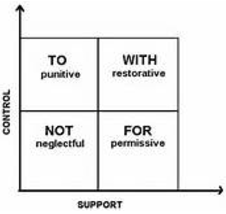 Restorative practices changes the mindset of trying to control things to an environment of providing support and encouragement. When we try to maintain control, discipline becomes the focus, which can be limit-setting. Students improve behaviors more often when they are nurtured and given support. What where you thinking at the time? Who do you think has been affected by what you did? - Try to avoid power struggles and conflict. These won't help students find motivation to learn. - It helped to hear/see the Dean perspective on issues that we have with kids. Explaining the methods of support, and the reasons behind them, make the issue come full circle, so the kid can come back to class in a positive manner. Travel the World Without Leaving the Classroom! Learning from our Peers! The tradition continues. Have you seen the 214Ready Blog? Check it out!